What's the quantitiy of ink in your PX720WD ink refills? Hi, I've just ordered two black ink cartridges for my Epson PX720WD printer but I now need to change them. I just wondered if I can return the cartridges I've ordered? Yes, the Epson PX720WD cartridges you've ordered can be returned, providing they're unopened in their original packaging. We'll send you a private email with details on how to do this. Hi, can you confirm for me if your compatible T0805 light cyan cartridge will fit my Epson Stylus Photo PX720WD printer? Yes, any of the cartridges listed on this page, including the compatible light cyan Epson T0805 ink cartridge, will work in your Epson Stylus Photo PX720WD inkjet printer. What's the total ml ink content for the Epson PX720WD originals per Epson cartridge, and your compatibles? Thanks. Each of the Epson Stylus Photo PX720DW ink cartridges (genuine or compatible) has a capacity of 7.4ml. Therefore, all six cartridges have a total capacity of 44.4ml. I understand that the main difference between the original and compatible cartridges is that the originals contain a cleaning agent that keeps the heads clear. Is this correct? Do your compatible Epson PX720WD cartridges contain a cleaning agent? I have never heard of genuine cartridges having a cleaning agent inside them. To ensure the printheads stay clear and unblocked you should run regular cleaning cycles. This applies when using both compatible and genuine cartridges. By using our compatible Epson PX720WD ink cartridges you won't be causing any blockages in the printheads and they will not void the warranty on your Epson printer. How good is the quality of your compatible Epson Stylus Photo PX720WD inks compared with original Epson inks? Our compatible Epson Stylus Photo PX720WD ink cartridges are made to a very high standard and you should not notice any difference between the quality of these cartridges when compared to the genuine Epson cartridges. In addition, we have a 30 day no quibble returns policy so if you aren't completely satisfied with any of our products you can return them to us for a full refund. If you need great discounts on Epson PX720WD inkjet cartridges, then take a look at Cartridge Save. We've an extensive range of PX-720WD cartridges available to order, which means that you won't need to use several hours driving around high street stores in search of offers like we have. PX720WD Supplies- Comes With A Money Back Guarantee! Never forget, every time you buy your Epson print cartridges from our company you will additionally get free next day delivery as standard. Additionally, every Epson cartridge on sale at our store comes along with a full 12 month money back assurance and our no quibbles product returns policy. Users that are looking for a decent photo printer that lets them print directly from their digital devices can consider the Epson Stylus Photo PX720WD. The technology used by Epson in this all-in-one device allows home users and photographers to get the best high quality prints, but documents being printed on plain paper may be disappointing. The Epson Stylus Photo PX720WD is praised for its design, 6-ink colour cartridge system, standard Wi-Fi connection, duplex printing features, and a built-in tray for direct DVD or CD printing. The intuitive touch panel controls make it user-friendly for amateurs while the 6.3cm colour screen built in to the Epson PX720WD printer makes it possible to preview pictures. It also has a memory card slot and PictBridge port, as well as the 2400x4800dpi CIS scanner. The Epson Stylus Photo PX-720WD is built specifically for creative and colourful projects. Two paper trays come with this printer for more versatile media handling. The auto duplexer helps users save time, and if they want to print directly from a camera or memory card, they can do so with PictBridge and the on-board card reader. 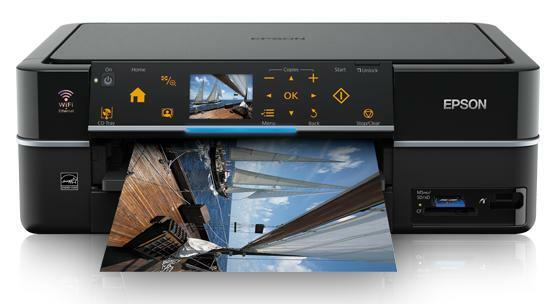 Colour printouts from the Epson Stylus Photo PX720WD look vivid and accurate especially on photo paper. This Stylus Photo PX720WD has built-in Wi-Fi, supports high-definition printing, and has a smart navigation touch panel to make it less overwhelming to use. Like its predecessors, the Epson Stylus Photo PX720WD is not the best printer for documents and other office jobs because of the poor text quality and sluggish print speeds (up to 8.8ppm only). The speed and quality further declines when printing in draft mode.